Having seen the dire forecast, PAUL ELLIS and ALASTAIR FORREST watched Dart 15s struggling and diving in steep seas, and agreed to sail only on Sunday. To PAUL�s consternation, Sunday morning saw sea fog on the Blackwater which did not lift until 13.00. 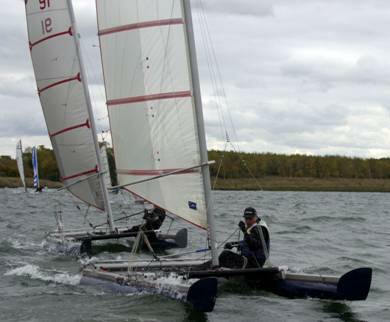 The wind did fill in and got up to a good F3 by the start of the long distance afternoon race � 2 laps of Osea Island. 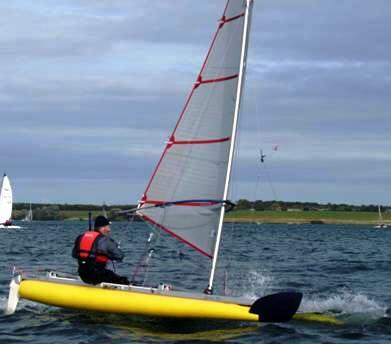 The 2 Catapults had a bumpy sail particularly with wind against tide on the north side of the island. 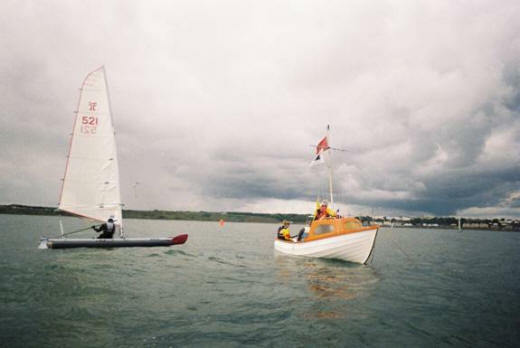 PAUL was first boat home by a fair margin with ALASTAIR 4th home. Local lad PETE STOKOE pulled off a port tack flyer at the start of Race 1, but GARETH EDE rounded the windward mark just ahead. With this move GARETH showed he was the man to beat! STUART EDE surfed past two to claim 2nd. PETE climbed back to 3rd despite another penalty and JOHN PEPERELL worked hard for 4th. GARETH led off the line in race 2 having stopped STUART�s port tack flyer and rounded the windward mark first. GARETH, CLIFF and NIGEL hung on to the top three places. 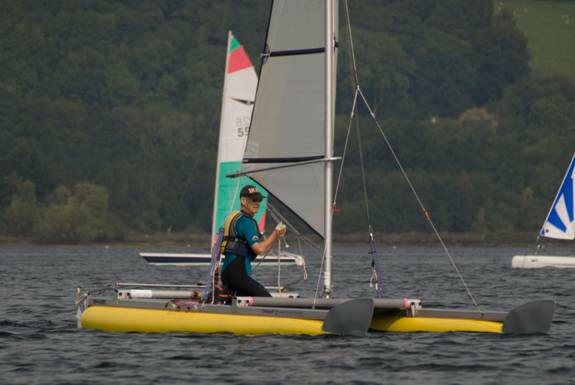 GARETH repeated his show of superior boat speed and mastery of the local conditions in race 3 by leading all the way round. STUART took a gamble which paid off to take 2nd while JOHN 3rd got ahead of PETE 4th. In race 4 NIGEL got a cracking start, but again GARETH was at the windward mark first. GARETH increased his lead and charged on to win. JOHN challenged STUART and the tussle lasted all the way to the finish. A mightily relieved STUART just crossed ahead to clinch 2nd. 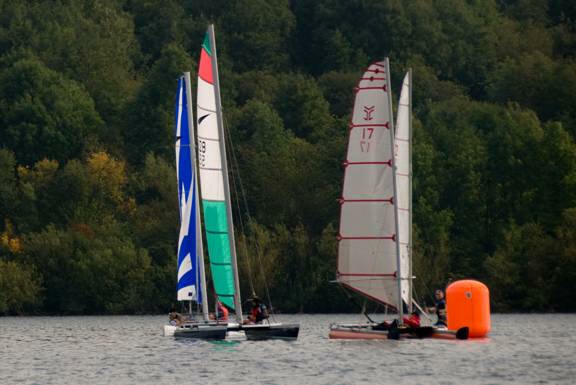 With four firsts from four races GARETH had the event sown up. So race 5 was the decider for second place between his Dad and CLIFF. ANTILL looked to have it in the bag with an early lead with STUART back in 4th. However, STUART fast reached past PETE for 3rd. Again STUART was pressured by JOHN, but held him off to claim second overall by a one point margin from CLIFF. GARETH took his fifth win which he could then discard! This event held on 6 July was fought out in a patchy Force 2. GARETH was first to the windward mark in Race 1, winning out over STUART, CLIFF and PAUL. Despite sailing into a hole on the last lap, he found local pressure and held on to win. PAUL and CLIFF held off a challenge from STUART to take 2nd and 3rd places. 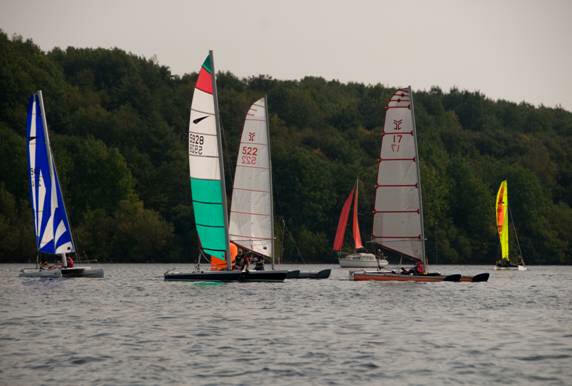 GARETH and PAUL were out in front in Race 2, but PAUL ploughed into GARETH at the gybe mark breaking a bowboard. That was effectively the end of PAUL�s event. STUART took the lead and held off CLIFF to win. GARETH missed Race 3 offering PAUL his spare bowboard. Early leader STUART lost out at the gybe mark to ALASTAIR and then to CLIFF on the reach. These three were in contention but CLIFF held on to 1st. The event result hung on Race 4. ALASTAIR led at the first mark. STUART snatched the lead on the next beat, but would loose out on the reaches. 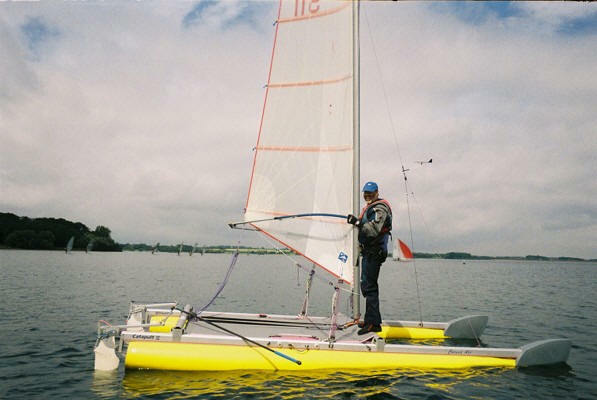 He proved faster upwind to hang on to first place. 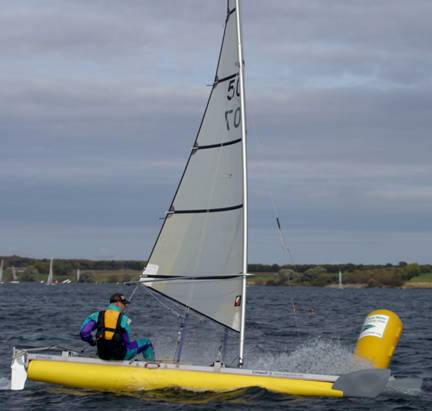 CLIFF�s second created a tie for first place overall, which STUART claimed on count back. As I drove past Chatsworth on the way to Carsington on the 20th of September I remember thinking what a beautiful day for golf! The only weekend of the year with gorgeous sunshine and no wind! The 4 Catapults swelled the Cat Open entry to 16. PAUL ELLIS ominously arrived sporting his BOSS hat - fresh from winning the Europeans he proceeded to boss events in the light airs. PAUL got of to a winning start in the first race. CLIFF ANTILL and ALISTAIR FORREST fought over second at different ends of the line. Sunday � Computer says Paul comes last! Despite winning all three races, club results show Paul as last! This was solely his fault for being so far ahead in each race that he always completed an extra lap over the rest of us! Paul was actually leading with three wins whilst Cliff needs to beat Alistair in the next race to capture second. Sunday saw the winds forecast to fall - how could there be less? After a delayed le-mans start, we scrambled to the line to catch the barest breath of wind. This is when PAUL made his fatal mistake. Thinking the big fast cats would eat us on starboard, he rejected the Port start favoured by the others. ALASTAIR � on port - stole the line from CLIFF. The big cats failed to progress on starboard and for a short period three Catapults of ALASTAIR, CLIFF and NIGEL lead the whole handicap fleet. CLIFF was faster than ALASTAIR whilst PAUL found pressure to overtake NIGEL. Not to be outdone NIGEL overtook PAUL!! At the line ALASTAIR went for the opposite end that had been favourable for the start (a cunning plan!) � CLIFF hit zero pressure 100 meters out and ALASTAIR got a win. NIGEL held PAUL off to take third (no mean feat! Ed). PAUL 6th, ALASTAIR 8th, CLIFF 10th, NIGEL 12th. The Carsington crowd made us all very welcome - lovely food! 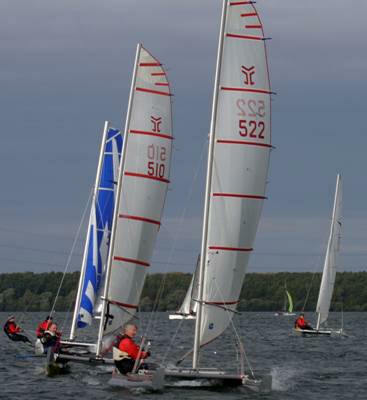 Grafham Water was quite inviting on Sat 18th Oct with sunshine and a F4 southerly. 9 Catapults turned up and it was particularly good to see new man TONY COSTALL who journeyed from Wales. The race officer judged we were all very fit, tough and had full bladder control as he decided to run 3 races back to back on both days! Saturday was OK but Sunday the wind increased and the last race became an endurance test with conditions becoming very unpleasant. From the start of race 1, GARETH EDE put his stamp on proceedings and went on to win all 6 races. The next 3 places were very close with STUART EDE scoring 14, and CLIFF ANTILL and PAUL ELLIS tying on 15 each. ALASTAIR FORREST was very consistent and scored 20. The first seven Catapults did well in the open event - outpacing the Prindle 15�s and were by far the fastest single handers. 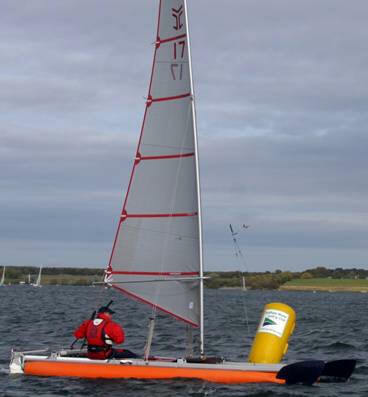 Three D16�s pushed GARETH down to 4th overall with the Dart�s 2 up but flying twice the sail area down wind! GWSC rated us at 1.235 and the D16 (2 up 3 sails) at 1.268.